National French Fry Day (July 13) is a holiday that most of us will likely avoid. Like we need to have a whole day to remind us of the guilt associated with eating fries? This year, CravOn™ Never Fried French Fries is inviting everyone to celebrate National French Fry way the guilt-free, healthy way -- with their yummy baked fries. We received a coupon and gift card to try CravOn fries and it's hard to believe they aren't fried! Just make sure you cook it the way it says on the instructions, and you will end up with unbelievably crispy, golden, salty fries. There are 4 varieties -- Ripple Cut, Steak Cut, Diamond Cut, and Diced -- available in your local grocer's freezer. They are absolutely delicious. We love fries just as much as anyone, so it's good to know that CravOn helps you satisfy your fry craving with a bit less fat. To celebrate National French Fry Day, CravOn invited me to play with my food create some fry art. Naturally I accepted, because I don't have to feel guilty about making mistakes and feeding the mistakes to the kids! I decided to combine my love of soccer with my love of fries. Unless you're living under a rock, you probably know that the World Cup is being held in Brazil, and the Brazilians are among the favorites to win the tournament. 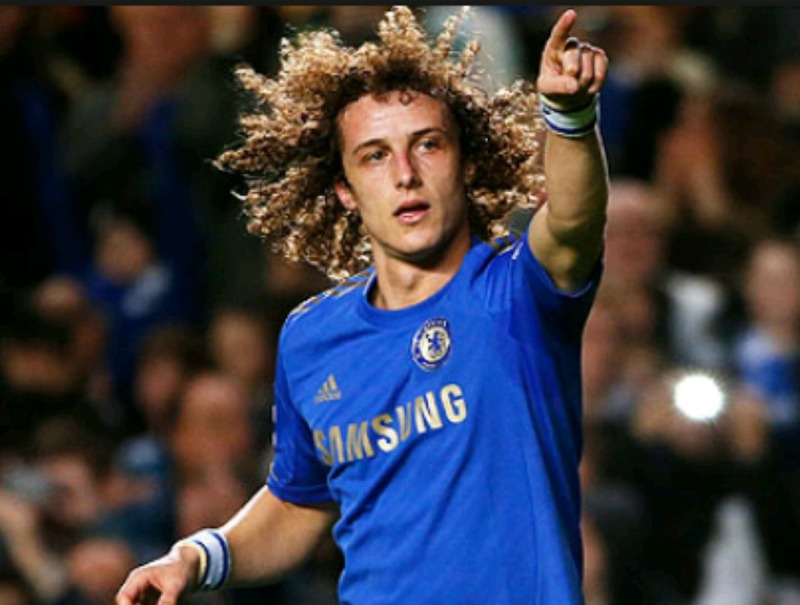 One of my favorite Brazilian football players is David Luiz, who is known for his brilliant defending, his tackles, his fouls, and his mop of wild, curly hair. 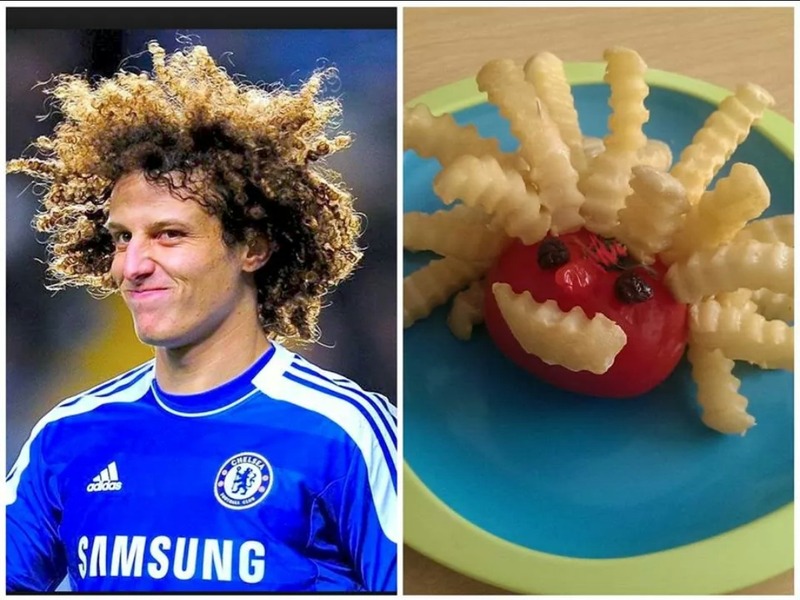 What better way to immortalize David Luiz than with curly french fries? Fortunately for my project, Alfie's first tomato of the season happened to be a bright red, round, fat tomato with a peculiar appendage that looks just like a nose. I used toothpicks to stick CravOn Ripple Cut Fries all over the tomato to form the hair. I used another fry for David Luiz's mouth, and two raisins for his eyes. That "third eye" you see in the center is actually the green tomato leaf top! I think the resemblance is remarkable, don't you?! Tomato David Luiz was almost too cute to eat! ALMOST. Once I gave the go-ahead, the kids attacked David Luiz with the same ferocity he uses to defend his goal. The sweet tomato was the perfect counterpoint to the salty fries. What a yummy way to celebrate the World Cup and French Fry Day! This giveaway ends at 11:59PM PST on July 15, 2014; I will draw a winner at random, on July 16 and post their name after they confirm acceptance. Continental US residents only. For additional giveaway rules, click here. Disclosure: I received a coupon and gift card to purchase CravOn fries and materials for this project. The views and opinions expressed here are my own. From the moment she was born, I knew The Pea was special. I realize the 70% of parents think their baby is above average, but she's different! I thought every inch of her was beautiful, from her wispy blond hair (hey, how many half-Filipino children can you think of with blond hair!) to the sweet little strawberry mark on the top of her head. 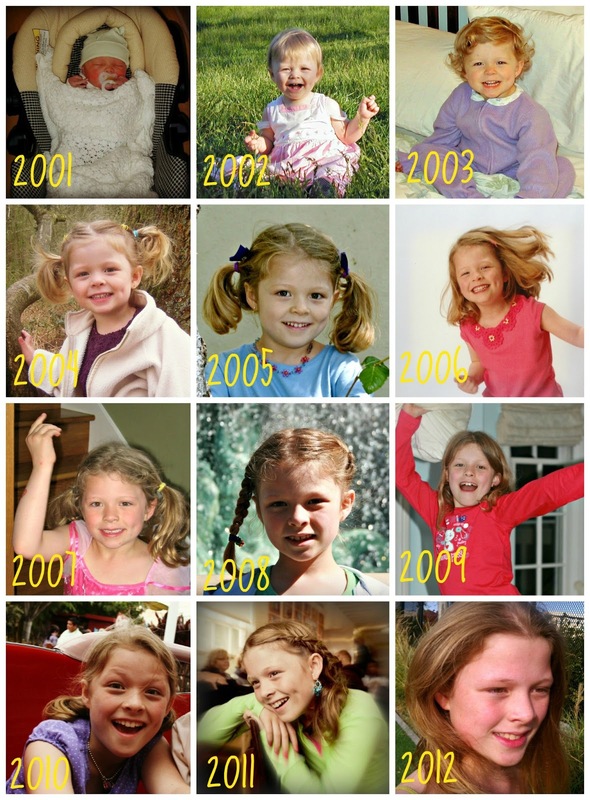 She's pretty and smart and funny and creative and the most extraordinary kid in the world. Unfortunately, not everyone agrees with me. One of the things The Pea loves to do most in the world is dance. Moving to music brings her so much joy, and I love watching the way her eyes shine and the way her smile lights up her face when she dances. Her effort and her love of dance is up there with the greatest dancers in the world -- but unfortunately her body doesn't always follow suit. For the last 3 years, she has auditioned to be part of her dance studio's competitive dance team, and for the last 3 years, she has been rejected. Many of her friends have gotten in, and she has not. She has had to watch them take extra classes and go to competitions (which of course improves their technique and makes the gap between them larger and larger). This year, she suffered a double-whammy: most of her friends got the approval to begin pointe lessons, and she did not. I guess her ballet teacher thinks she needs more training. It has been hard on her, and it has been hard on me. I know she would give up her straight A's and students awards to make that team, but this is a life lesson that she has to endure. I hate it. My heart breaks every time she hears the bad news, and I have cried with her and comforted her. Seeing her want something that badly, and working so hard to get it, and not getting it, makes me feel helpless and frustrated. I feel like I would do anything, talk to the teacher, complain, demand, anything. But The Pea is a better person than I am. She doesn't want me to beg and plead with the teacher, or make a big fuss about it with the dance studio director. She told me she wouldn't want to make the team or the pointe class if the reason was because her mom intervened. And every year, she picks herself up from that devastating disappointment, smiles and congratulates her friends, and keeps on working and dancing. That dedication and determination is why I love The Pea with all my heart, and that's why she'll always be the most extraordinary kid ever. 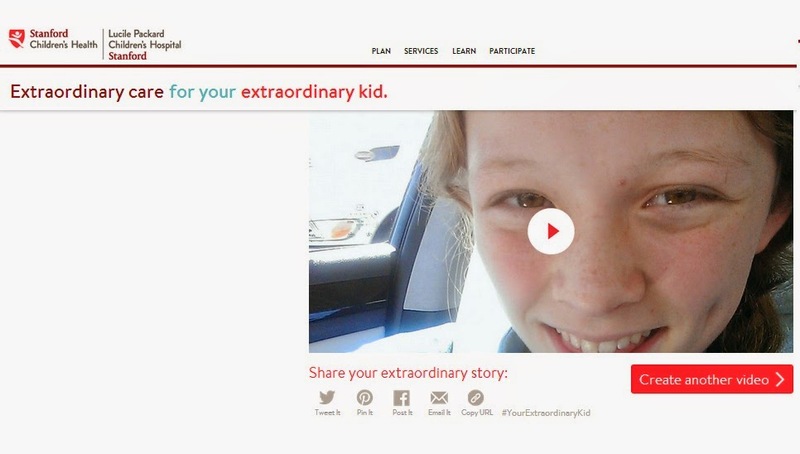 Your kid is extraordinary. Show them how much you enjoy every moment together by creating a special video of your own!" It's summertime! Time for pool parties, water gun fights, runs through the sprinkler, trips to the beach, and more. 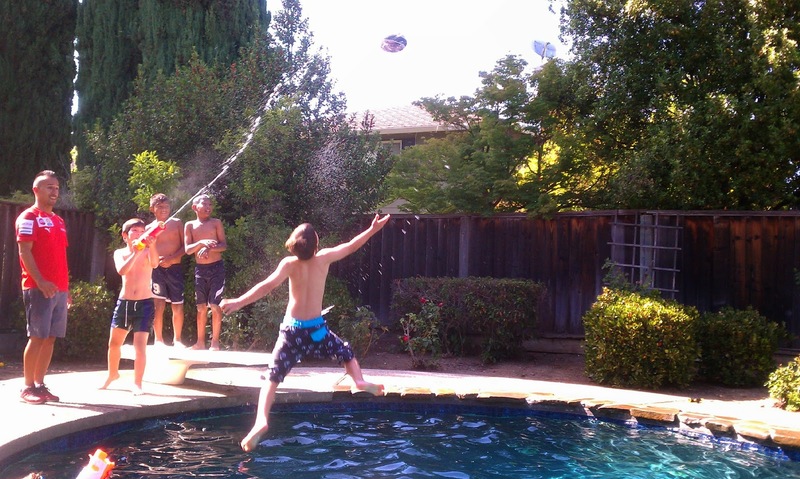 Water plays a big part in our summer fun...... which is great for people, but not so great for cameras and phones. This is me, five seconds after I was trying to take a group picture at a pool party, and unknowingly stepped backwards into the pool! The whole incident was hilarious and embarrassing at the same time. Only my dignity suffered....oh, and Alfie's phone. I was using it to take the photo, so it went into the pool with me. Of course it shorted out. It eventually turned back on, but the sound was completely gone, and we had to dry it in a bag of rice overnight. Not everyone is so lucky. I'm sure more than a few phones have drowned after falling into pools, sinks, toilets, and bathtubs, or even after having a glass of water knocked over them on the table! That's why I was so psyched to find out that one of my "duties" as a Mom Central #SprintMom Sprint Ambassador would be to try out the Kyocera Hydro Vibe waterproof 4G LTE smartphone. It can be completely submerged in up to one meter of water for up to 30 minutes! I have no idea how they do it. Not only did the phone survive, it thrived. The phone did not shut down and the music kept playing (once the speaker is submerged in the water, the sound gets muffled). Note, if you're thinking about using the Kyocera Hydro Vibe to take underwater photos at your next pool party, think again. The phone camera doesn't like being dunked. 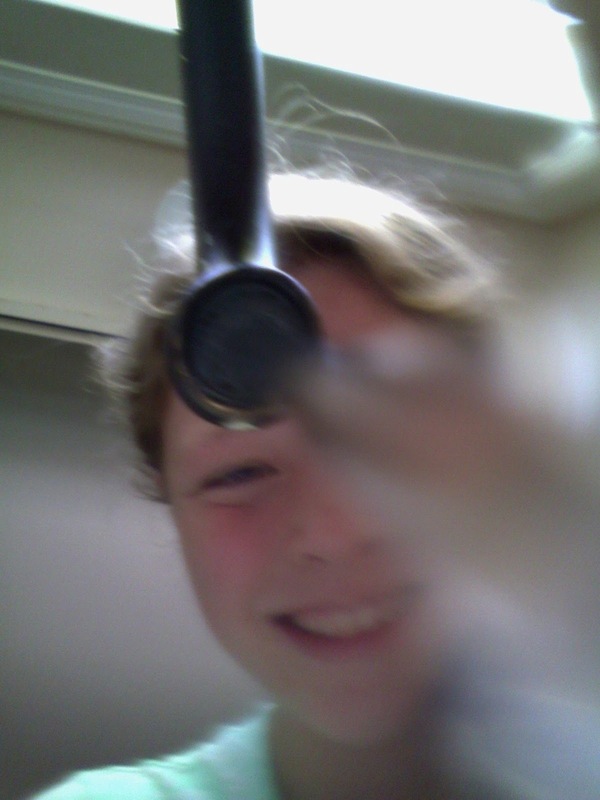 We were able to take a selfie with the phone held under a running faucet, but when we tried to dunk the phone into a vase of water while taking a video, the video stopped and the phone display went back to the home screen. But the nice thing about this phone is that you can take it around with you at a water park, you can use your phone at the pool to make calls or take photos or check your email, you can take it out on a rainy day and take photos, all without worrying about water splashing on it. Its waterproof capabilities aren't the only great things about the Kyocera Hydro Vibe. It's a good little phone, with a good-sized screen and a decent display (4.5 inch qHD impact-resistant touchscreen). The camera (8-megapixel rear camera with LED flash and video camera) is not the most high-end offering, but it takes decent photos. It comes with a 2,000mAh battery for longer use on a single charge (which is important to us because The Pea, who will be using this phone, was constantly forgetting to charge her old phone!). Finally, as part of Sprint’s offerings on this new device, the Kyocera Hydro Vibe waterproof 4G LTE smartphone will have the added benefit of running on the Sprint Spark network, which enhances the phone’s LTE service, allowing for high quality video. Best of all is the price -- at this time, it could cost as little as $29.99 with a 2-year service agreement from Sprint! I think it's perfect for teens and tweens because it has all the functionality they love, it's sturdy enough to withstand their active lifestyle, and it's priced right :) All in all, a great value for the money! Disclosure: I participated in a campaign on behalf of Mom Central Consulting (#MC) for Sprint. I received a product sample to facilitate my review and to thank me for participating. The views and opinions expressed here are my own. 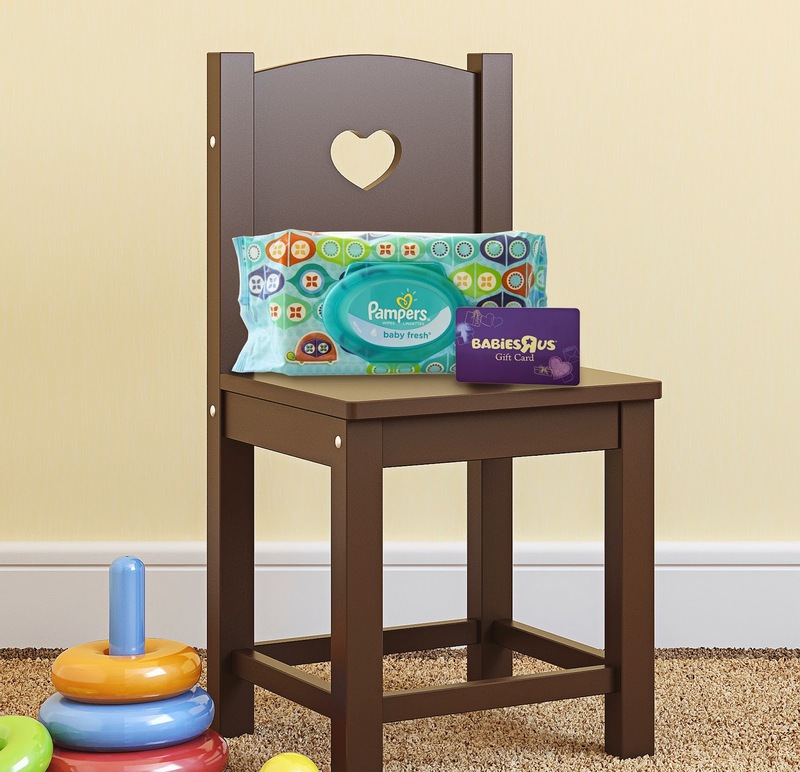 Giveaway: enter to win a $150 Babies R Us gift card! Don't you wish babies came with instruction manuals? Despite all the advice you get from your friends, parenthood is definitely a learn-on-the-job kind of experience. But that doesn't mean you can't prepare yourself and heed the advice of people who have been in the trenches and done it before. Below are five pieces of advice for new parents that I had to learn the hard way. I wish someone had told me about these, so I'm sharing them in the hopes that a bleary-eyed new mom or dad will read it and take note. These tips will make your first year of parenthood go so much smoother! 1) Accept offers of help from friends or family. Babies are tiring, and you can't do everything. Even a little help goes a long way. We didn't have family living nearby, so we splurged on a weekly housekeeper, and it was the best money we ever spent. I got more rest. I was much happier, less cranky. I stopped snapping at Alfie and nagging at him to help. 2) Don't stress about giving your child a pacifier. It's not going to ruin their teeth. They will give it up eventually. You AND your baby will be much, much happier. 3) Use a sleep sack instead of a blanket. We discovered sleep sacks when the boys were 18 months and it was like a Godsend. They would constantly kick their blankets off while sleeping, and wake up cold and cranky, but with a sleepsack, you can zip your baby into it without worrying that they will kick it off, or fear that they will suffocate under the blanket. 4) Find a dependable diaper and change it often. Don't wait until it's sagging down to your child's knees! On one memorable occasion, we went on a road trip with Alfie's parents and forgot to change the twins' diapers for the whole 4-hour drive. When we got to our destination, we left Alfie's dad in charge of one baby and went to reserve a table at a restaurant. Alfie's dad joined us at the table -- with a smiling baby and a burst diaper! Oh the embarrassment (not to mention the mess)! 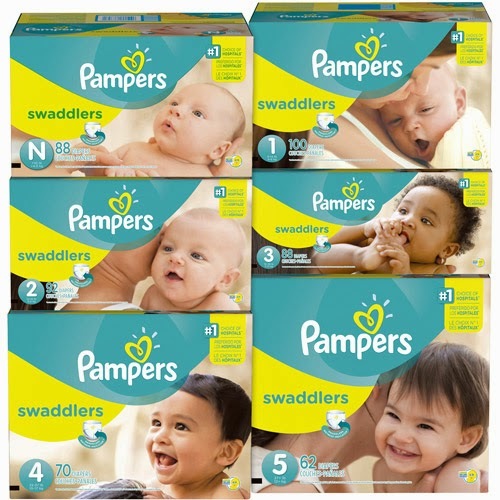 One diaper brand that parents everywhere rely on is Pampers. To cover your baby's bottom, you’ll want to pick up Swaddlers, Pampers softest diaper and the #1 choice among hospitals. · Available up to size 5 at Babies “R”Us, their knowledgeable experts can help you choose the perfect fit for your little one. 5) Savor and celebrate those milestones. Babyhood, toddlerhood, and childhood pass by in the blink of an eye. Really. I can barely believe how quickly time has flown. So take those 1,000 photos and 20-minute videos of your baby rolling over, sitting up, smashing bananas into his mouth, taking his first steps. Even the little things are cause for a celebration. I wish I had more photos of my kids looking adorable in their diapers, or splashing around in the tub! Leave a comment on this post and share a milestone moment in your baby's life. 4) Pin this giveaway on any of your Pinterest boards (1 entry, please make sure you include the #MilestoneMoments hashtag on your pin -- you can use the "Pin It" button at the bottom of this page!). This giveaway ends at 11:59PM PST on July 12, 2014; I will draw a winner at random, on July 13 and post their name after they confirm acceptance. Continental US residents only. For additional giveaway rules, click here. Disclosure: . Product information (in italics) is provided by Procter & Gamble. The views and opinions expressed here are my own. Even though I work part-time, I'm technically the stay-at-home parent, so most of the traditional "housewife" duties have fallen to me. I cook, clean (sort of), do carpool duty, and do the laundry. But the one thing I will NOT do is ironing. Alfie is a stickler for perfectly ironed clothes, so he irons his own stuff. As for the rest of us, I only iron out the worst wrinkles, so the kids and I go out in wrinkled clothing quite often. I detest having to slave over a hot iron! 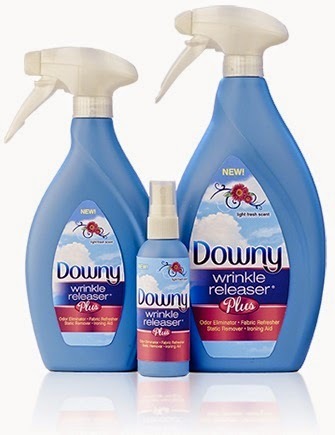 I've heard of wrinkle release sprays for quite some time now, but I've never actually used them until I got an offer from Downy to try out New Downy Wrinkler Releaser Plus. Now that The Pea is a teenager, she cares a lot more about how her clothes look, and I get way too many requests to iron her clothes! I figured it was time to see if New Downy Wrinkle Releaser Plus could actually save me a lot of work. When the kids are out of school and wreaking havoc on the house every day, what parent has time to get out the ironing board, wait for the iron to heat up and then iron an outfit in the morning? Finding time to shower and brush your teeth is hard enough. This summer when your linen, cotton and lightweight summery shorts and shirts are a wrinkly mess instead of ironing, you can simply spray the wrinkles away with the new Downy Wrinkle Releaser Plus. Spray it on clothes, give them a tug to loosen wrinkles and then smooth them flat. 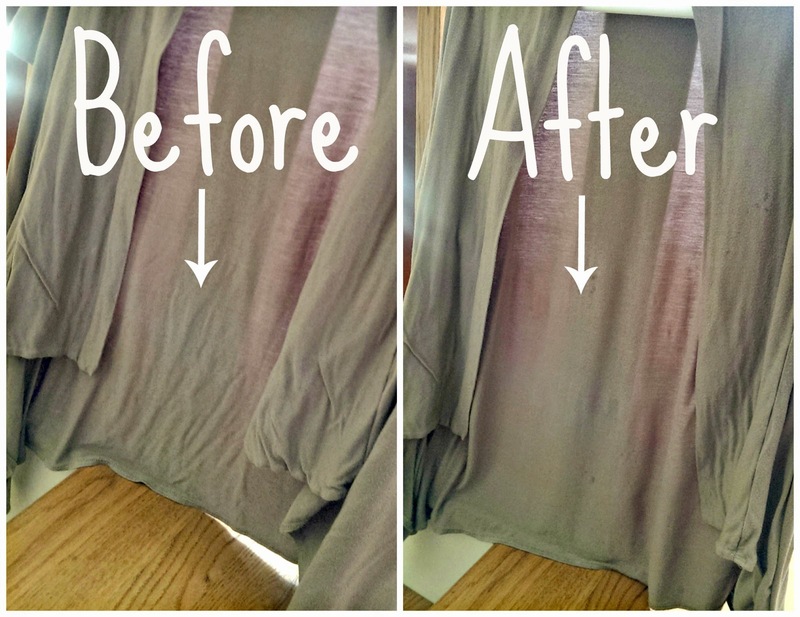 As your clothes dry the wrinkles will magically disappear. Here's close-up of another section of my cardigan. As you can see, the wrinkles are pretty bad in the "Before" shot, but New Downy Wrinkle Releaser Plus took care of the worst. Note, this is still not a perfect substitute for a hot iron. You'll have to drench the fabric (see the wet spots in the "After" photo where I was a bit too trigger-happy?) to really get rid of the deepest wrinkles -- which means your clothes will smell like fabric freshener. But it does make the difference between going out looking like a wrinkled mess, and looking presentable. I'm not a big fan of scented anything, so I wish they made an unscented version. Downy Wrinkle Releaser has officially joined my list of laundry closet staples. Finally, I can tell The Pea to "iron" her own clothes! 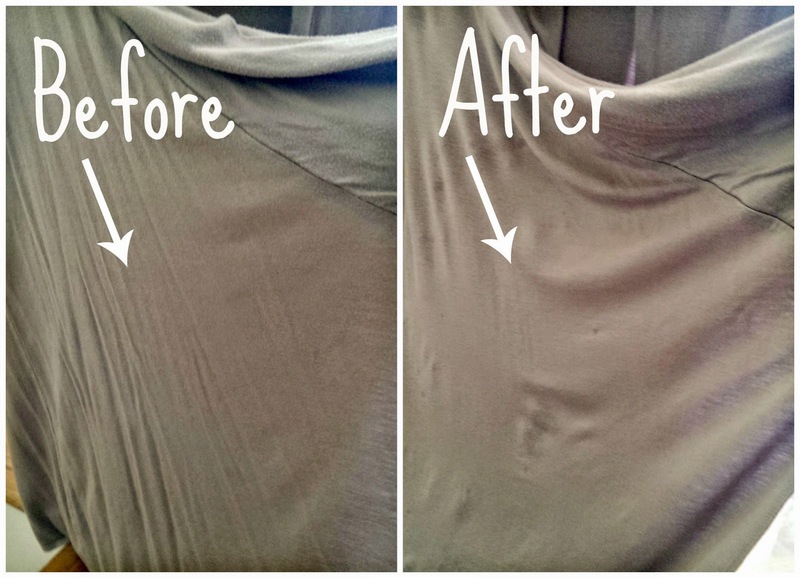 And I can remove the worst of the wrinkles in my own clothes, with minimal effort. Disclosure: I received a product sample for review. The views and opinions expressed here are my own. Maisy is back for a rousing game of soccer with her friends! 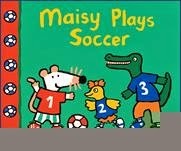 In this fun read-aloud from the Maisy First Experiences series, the spunky mouse gets ready to play her first game of soccer with friends. They divide into teams, and then it’s time to play. No matter who wins, it’s fun for everybody. Great for young soccer players who can’t wait to get on the field! We have always been big Maisy fans ("Maisy" was the nickname we gave The Pea in utero), and the kids were thrilled to revisit their favorite childhood characters. This book is great for the youngest kids because it captures all the excitement of a soccer game. Take a trip to Rio! Visit the colorful streets of Brazil’s largest city, soon to be the home of this year’s World Cup and the 2016 Olympics. In this compact pop-up keepsake, you can visit the giant statue of Christ the Redeemer, the historic Municipal Theatre, the Carnival de Sambodromo, and more, all without leaving your armchair. 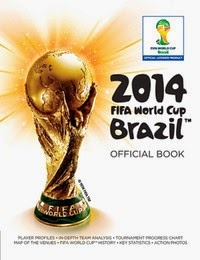 With full-color illustrations, this would make a fantastic gift for those eagerly awaiting the World Cup. 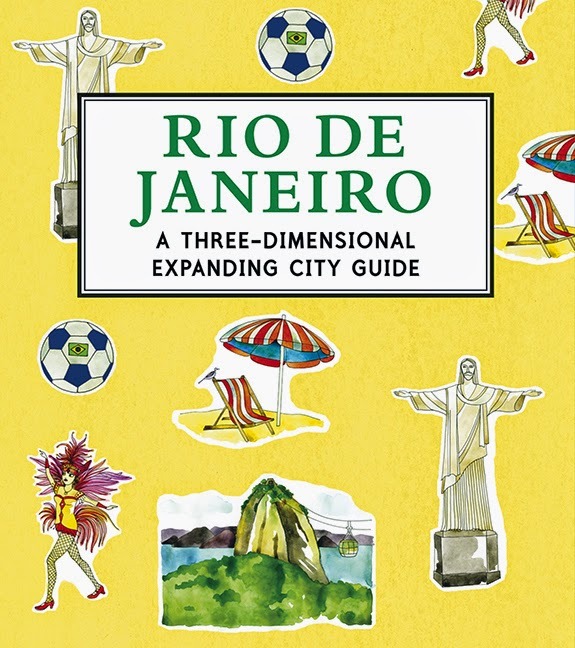 Travel fans will appreciate this handy little book, and so will those looking to learn more about the city hosting many of the World Cup matches. Kids and grownups will love the cute 3D features! Nothing makes Sierra happy like soccer. She loves to play, even though she has to drive far away from home for games. But nothing makes her sad like soccer, either; her aunt works on game days, and nobody is there to cheer for Sierra. This beautifully-illustrated book from award-winning author Maribeth Boelts is now available in paperback, just in time for peak soccer season. Paulo Marcelo Feliciano dreams of being a soccer star. But when one of his teammates breaks his wrist, will he let his younger sister Maria play alongside him? 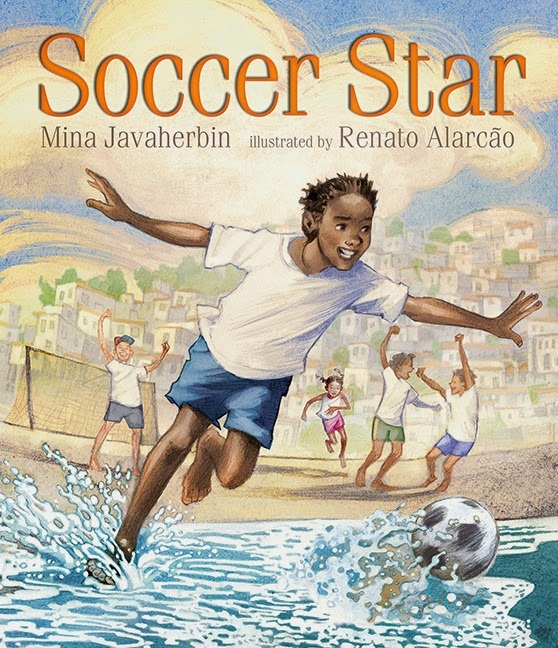 Set in a small village in Brazil, this story by the author of Goal!, explores how wonderful it can be to play soccer – just in time for the World Cup! I had a real emotional reaction reading this book, because many of the characters are kids who are too poor to go to school (they need to work to earn money). It serves as a good eye-opener to kids in America about how many kids around the world live, and how lucky they are to have so many opportunities in this country. In a dusty township in South Africa, Ajani and his friends have earned a brand-new, federation-size soccer ball. They kick. They dribble. They run. They score. These clever boys are football champions! But when a crew of bullies tries to steal their ball, will Ajani and his friends be able to beat them at their own game? This paperback edition of Mina Javaherbin’s award-winning book touches upon humor, suspense, and excitement while inviting the notion that cultures can be linked together through sport. We've owned this beautifully illustrated book for a number of years, and the kids love reading it because it sends the message that soccer is universal. In this hauntingly compelling novel, a veteran soccer reporter interviews a World Cup-winning goalkeeper about his life. As the long night unfolds, we learn of El Gato’s humble beginnings in a small town by the edge of the jungle – and of his ghostly mentor, the Keeper. This ALA award-winning book will appeal to fans of sports and ghosts alike, and the slim paperback edition is sized just-right to carry to a game. I read this book a number of years ago and I enjoyed it because I love a good rags-to-riches story, and becauseit provides a great insight into the mind of a champion. The book is rated for ages 10 and up, but the kids haven't read it yet because they're a bit wary of ghost stories, so I'm holding on to it for a bit longer, until I'm sure they can handle the concept. Disclosure: I received review copies of all books except Goal and Keeper. Product information (in italics) is provided by Candlewick Press. The views and opinions expressed here are my own. Looking to update your wardrobe this summer? With all the brands and styles out there, the choices can be overwhelming. Fortunately, there's one choice that's easy to make: where you're going to shop, and the answer is Ross Dress for Less! It's always my first destination when I'm looking for a new outfit, because they have so many great brands, and the prices are so great. You love to take care of everyone in your family! With the kids out of school, summer is the perfect opportunity for more together time and you are definitely taking advantage of each moment. You can bet you’ll be creating memories all summer long and will have a ton of photos to prove it. So, are you a Family Fun Patrol like me, or are you an Outdoor Explorer, or a Social Butterfly? Take the quiz and find out! To make things even more fun, everyone who takes the quiz will be entered into a random drawing, with 2 $150 gift card winners drawn each week! 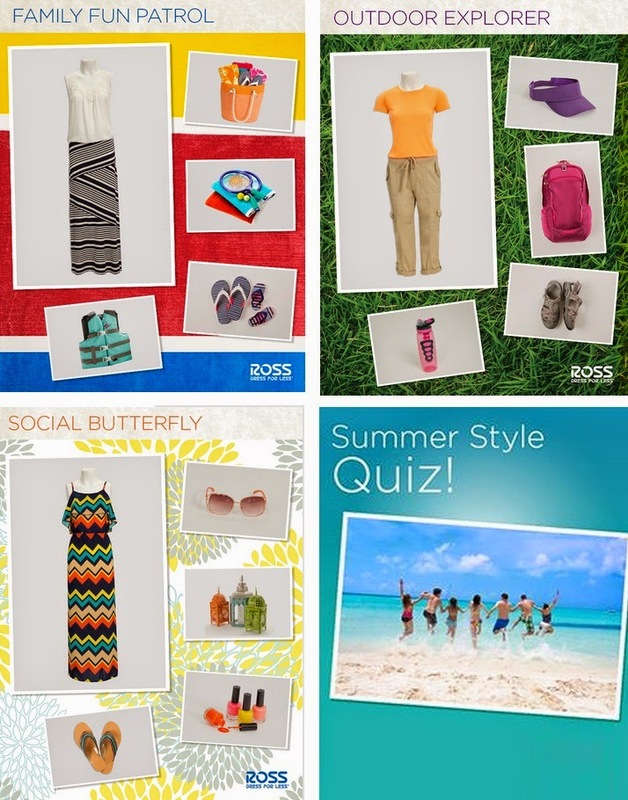 If you share the results of your Summer Style Quiz with your Facebook friends, you'll get an extra entry. Disclosure: I received a Ross gift card as a thank-you for posting about the Summer Style quiz. The views and opinions expressed here are my own. • Press the "record" button and make a mini 6 second LEGO GIF video that can be shared to Twitter and Facebook. Videos instantly get posted to YouTube for everybody to enjoy! Here's the GIF movie that I created! It's super easy, just move your mouse across the app screen to get the animation going. Your mini-movie will save to a LEGO Gif creations YouTube account, so you don't have to use your own YouTube account. Then you can share it via Facebook or Twitter! Want to create your own? Here's the app! Create a 6-second GIF video using the Everything Is Awesome blog app, and leave a comment on this post with the link to your video. This giveaway ends at 11:59PM PST on June 30, 2014; I will draw a winner at random, on July 1 and post their name after they confirm acceptance. Continental US residents only. Each household is only eligible to win The Lego Movie Blu-Ray via blog reviews and giveaways. Only one entrant per mailing address per giveaway. If you have won the same prize on another blog, you will not be eligible to win it again. Winner is subject to eligibility verification. For additional giveaway rules, click here. Disclosure: I did not receive a sample or monetary compensation for this post. Product information (in italics) and giveaway prize is provided by Warner Bros Home Entertainment. The views and opinions expressed here are my own. 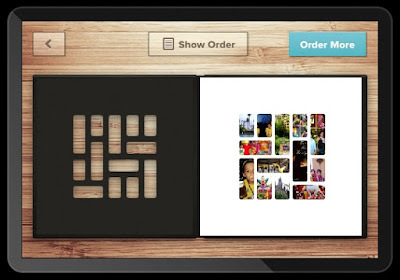 I've always been a big fan of Mosaic's lovely-to-look-at, easy-to-use, quick-to-arrive photo books. And as an Android smartphone user, I'm an even bigger fan now that the Mosaic app is available for Android! Now it's easier than ever for me to create a beautiful photo book from the photos on my phone. 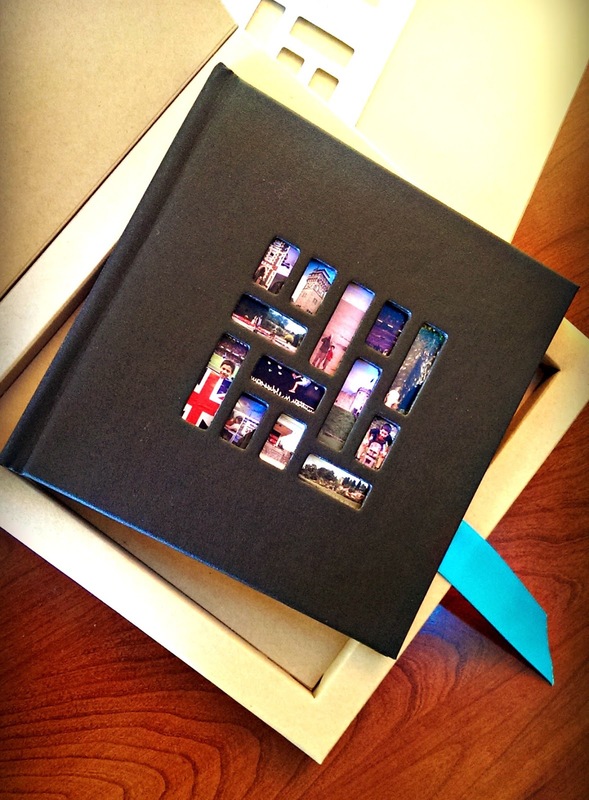 A Mosaic photo book costs just $20 plus shipping and handling, which is a great price for such a beautiful book. Step 1: Choose your photos. 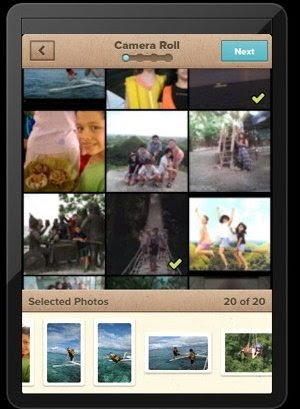 You can choose 20 photos from your camera roll, and you can choose the order in which they will appear in your photo book. Step 2: Choose whether you want your photos to appear on a white or a black background. You get 1 photo per page, no cropping, no zooming, no captions, so if you want to edit your photos at all, do it on your phone or tablet before loading them into Mosaic! 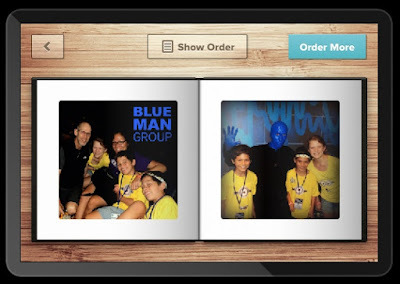 Step 3: The first page of your Mosaic photo album is a randomly generated collage of 13 of the photos in your book. If you don't like the photos that appear, you can reshuffle. Step 4: Place your order. That's it! You don't have to create an account, just give your name and address. Your book will be printed in 48 hours and delivered in 4 days. It arrives in stylish kraft paper box -- perfect for gift giving and for storage. 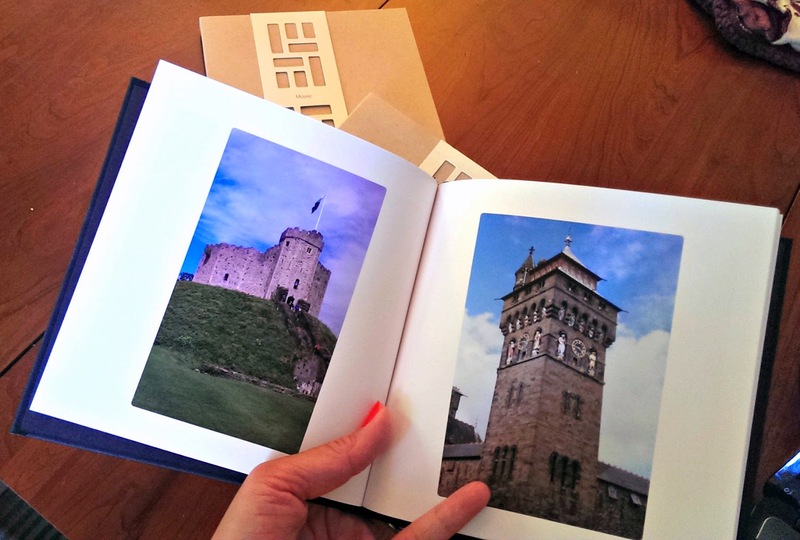 I've made many Mosaic photo books from our past vacations, and they make wonderful conversation pieces when family and friends come over to visit. 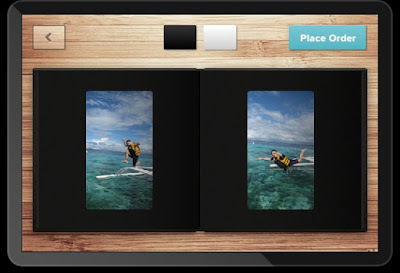 No one ever has photo albums any more, so all our photos are hidden away on a hard drive or in the Cloud. It's so nice to be able to show people something they can hold in their hand -- and since it's just 20 photos, you won't bore them to death. Somehow, crowding around a computer screen is just not as fun as flipping through the pages of an actual book! Don't forget, today is Father's Day -- what better way to celebrate the dad in your life than with a Mosaic photo book or a Mosaic gift card so he can create his own photo book!